Nyota Uhura was born in the year 2239 in the United States of Africa on Earth. She was fluent in Swahili and had an aptitude for mathematics. She ran the hundred meter dash in record time. Uhura began her Starfleet career in 2265. In 2266, Lieutenant Uhura was a command division officer aboard the USS Enterprise. She was the head of the Communications Department. 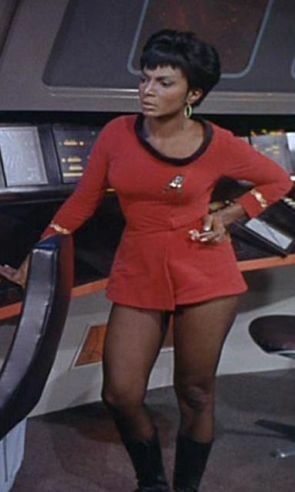 Later that year, Uhura was transferred to the operations division. In the following years of that vessel's historic five-year mission, she proved to be a proficient technician and was considered by Captain Kirk to be a capable and reliable bridge officer, manning the helm, navigation, and main science station when the need arose. On stardate 1672.1, before taking a brief on-board ship sabbatical, Uhura's voice was heard ship wide reminding her fellow crew members to file their accurate "time sheets via the communications department." On stardate 1704.2, Enterprise navigator Lieutenant Kevin Riley, while under the influence of the Psi 2000 polywater intoxication, left his post at navigation and Commander Spock assigned her to the station until Lieutenant Brent relieved her from that duty later the same day. On stardate 1704.3, Lieutenant Hikaru Sulu, also under the influence of the polywater intoxication, fantasizing himself a musketeer, took Uhura under his "protection" before first officer Spock subdued him with a Vulcan nerve pinch. On stardate 1709.1, Uhura also took over the navigation post when Lieutenant Stiles was needed elsewhere on the ship during the confrontation with the Romulans near the neutral zone. In 2267 from stardate 2821.5 to 2823.1, while the Enterprise shuttlecraft Galileo was studying the Murasaki 312 quasar, it was lost and then crashed on an uncharted planet. Because Spock was the commander of that mission and was not on the Enterprise, Uhura took lead in the search for the missing Galileo and took over at the bridge's science station, as well as still helping at communications relieving Lieutenant Brent at sciences. Uhura discovered the planet Taurus II that the Galileo had crashed on. After Spock and the four other surviving crew members were found and rescued, Uhura was happy to allow Spock the science station back under his command. In 2267, Uhura was part of the landing party that beamed down to the Guardian of Forever planet to find Dr. Leonard McCoy, who was in a wild state of mind due to an accidental overdose of cordrazine. Uhura was the first one of the landing party to notice that they had lost contact with the Enterprise. This was due to the fact that Dr. McCoy had run into the Guardian of Forever altering the timeline and erasing the Enterprise and everything the landing party knew becoming nonexistent. This was the only time where Uhura actually admitted to someone, specifically Captain Kirk, that she was truly frightened (without being under an influence of an alien force taking control of her mind). Fortunately after Kirk and Spock went through the Guardian of Forever and then came back from the past with Dr. McCoy they restored the time line and the existence of the Enterprise. Following a communications blackout caused by Apollo, jamming all communication frequencies between the Enterprise and her landing party on stardate 3468.1, Uhura attempted the delicate task of rewiring the entire communications system in an attempt to break through the interference. In conjunction with Sulu's rigging of all transmission circuits for maximum power generation, Uhura successfully connected the bypass circuit, a task she had not done in several years. Spock praised her work and could think of "no one better equipped" to handle the necessary repairs.